Table games dealers lead and control games played at casinos, calculate winnings and losses, and pay out winning bets. Chances of getting a job as a table games dealer are average due to high competition for regular vacancies. Pay for table games dealers varies depending on their experience. Table games dealers in training usually earn $16 an hour. With up to 150 hours experience they usually earn between $16 and $19 an hour. Experienced table games dealers that know several card games can earn up to $20 an hour. Table games dealers may also get subsidised meals, health insurance, incentives and employee discounts. close the float and table, and make sure it all balances. Table games dealers are usually trained in only a few games. good maths and customer service skills. usually work in casinos and on cruise ships. 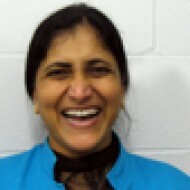 Radha Vellanki, who had been a teacher in India, was initially hesitant about taking a temporary job as a dealer at SkyCity Auckland's casino. "In India a casino is not the type of place where a respectable woman works – I didn't even tell my parents where I was working! But as I started to grow into my role, to see what an excellent place it was to work, I felt quite the opposite. I'm now proud to say I work here." 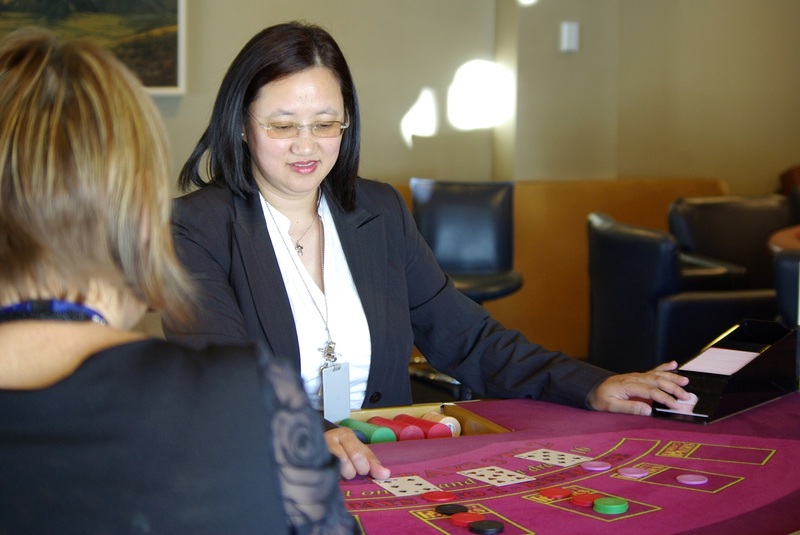 In her role as Table Games Manager, Radha oversees the supervisors and staff who run the different table games, and it is her job to ensure that both the players and the employees are kept happy. "It's a multitasking role so you have to keep your eyes on many different things at once – whether it's keeping the table stocked with chips, planning the rosters, recruitment and training, or making sure the staff are paid on time. "Many of the negotiation techniques that I first learned in the classroom come in useful! You need good communication above all, but then patience, flexibility and dedication." Rene: Hi, my name is Rene Askew and I want to learn what it’s like to be a table games dealer at Skycity. Clinton: So we’ve teamed Rene up with table games supervisor, Rebecca Semu who started working at Skycity when it opened in 1996 as a table games dealer. Rene: Wow, so what’s it like working here? Rebecca: Well it can be exciting, rewarding and challenging all at the same time. Rene: Why is it challenging? Rebecca: It’s challenging because we have to deal with people's money on a day-to-day basis. Now, we have to celebrate their win, and we also have to empathise with them when they’re losing but always remembering that they’re here to have a great time, every time. Clinton: But, not everyone is cut out to be a dealer – applicants need sharp maths, good English, and perfect eyesight...and then get through four weeks of dealer boot-camp. Rebecca: Welcome to our training room – here we have some students already in the middle of their training. Rene: Guys, what’s training like? Moana: It can be challenging and pretty full-on, but it’s worth it. Olive: It’s really intense, it takes a lot of commitment. Kathleen: It’s pretty fun – well you get paid to play games and have fun! Steven: I saw it as a massive career path because this job can take me anywhere around the world and that’s exciting. Rebecca: One of the most important things that you’ll learn as a dealer is dexterity, card work, as well as chip work. Now let me introduce you to the fastest hands in all of Auckland – Mr Edmond Osa, who will be your trainer. Ed: Thank you, Rebecca. Hello Rene, nice to meet you. I’m just going to come over here and show you some card-handling skills. Clinton: Dealing requires a pack of card skills. First is riffling and shuffling. Ed: …and then you start, again. Rene: You must play a mean guitar! Ed: I play guitar, but not that mean! Clinton: And spreading, to show the player that there is a full pack and that the cards aren't marked. Ed: OK, so let’s do some chip work! Clinton: There are two things dealers handle in a casino – cards and chips. Clinton: Because chip work is all about speed and accuracy, it might take some time for Rene to master it. Clinton: A qualified dealer needs to be able to pick up 40 loose chips in 20 seconds. Ed: That’s it, and then we show clear hands, OK, to make sure that we don’t have any chips. Clinton: So, Rene puts these skills together and learns how to deal a game of Black Jack, including a technique important when dealing with real players. Rene: How do you pick the cards up? Ed: Normally we always go from right to left, OK, so what we do is we press this one and then go like this. Rene: Why do you pick them up in order? Ed: We need to pick them up in order in case a pair dispute their total and we can – what we call, reconstruct the cards – so it’s still in proper order. Rene: What’s it like being a dealer? Ed: Once you get used to it and enjoy the game with the players, it becomes very, very fun. Rene: What do you enjoy the most? Ed: Meeting a lot of new people, new players all the time, and especially if they enjoy the way you deal, they follow you so you’re like a superstar! You have fans following you and liking the way you deal and interacting with you so it’s quite fun, but you’re going to find out because we’re going to put you on the main floor and you’re going to be dealing, live! Rene: Evening, ladies and gentlemen! Clinton: So Rene’s new-found skills are put to the test in the casino in a carefully managed and controlled practice session with some of her friends. Rebecca: So she’s done the first step correctly by introducing herself to the table and welcoming everybody to the game. Rene: Good luck on your Ace, sir! Rebecca: Her card placement is very good – exactly how we want it. Clinton: Things are going well, but, Rene can't let her guard down because casinos can contain people who don't play by the rules. Rebecca: Rene, keep your hands on the shoe please. Rene: OK, last player has 20, dealer has…20! Rebecca: The reason why it’s really important for Rene to cover the window of the shoe is because some cards could be marked and we might have people who could be potential cheats out there so it’s really important that she keeps her hand on that shoe and keeps that covered. Clinton: The thrill of playing for money is entertaining but for some the thrill can get out of hand. That’s why Skycity have a team dedicated to host responsibility. Amanda: Dealers, housekeepers, cleaners, bar staff – everybody does an e-learning module which is about host responsibility and that’s problem gamblers and responsible service of alcohol. Clinton...and, there is another skill, that is just as important. Rebecca: I want to see her communicate more, I want her to talk a little bit more, just to relax as she’s dealing and get comfortable with them. She can be a mate to them – but not too pally! Still maintain her professionalism! Guest: Actually, I thought I had 21? Rebecca: Hi ma’am, what’ seems to be the problem? Guest: I thought I had 21? Clinton: Rene was trained to pick up the cards in order but, did she do when it mattered? Rebecca: If it’s all been picked up correctly, we’ll see what you’ve got, OK? Rebecca: So starting with the dealer's hand, she had 21, correct? Rene: I found there’s a lot of technical skills involved like dexterity and maths but personality was a big factor in it too. Overall I really enjoyed it and I would love to do this job. Clinton: To enter a career as a table games dealer at Skycity you’ll need to be 20 years or older. You cannot be colour blind and you must declare any criminal convictions, any significant debt, and any conflicts of interest. You'll need to have a good level of numeracy and literacy, and have excellent communication skills. You will need to obtain a Certificate of Approval from the Department of Internal Affairs. If successful, Skycity will give you four weeks of training in various games. Table games dealers work shift hours, so flexibility is important. hold a Certificate of Approval from the Department of Internal Affairs. Table games dealers are trained for four to six weeks before they start working, and continue to gain skills on the job. There are no specific secondary educational requirements to become a table games dealer. However,a good standard of English and maths is preferred. Useful experience for table games dealers includes money handling or customer service roles. to be fit enough to cope with standing for a long time. Job opportunities arise fairly frequently at casinos due to promotions, resignations and retirements, and most casinos have regular intakes of new staff. For example, Skycity Auckland may have between three and six intakes of trainee table games dealers each year. good employee benefits and discounts. Skycity's casino in Auckland employs the most table games dealers in New Zealand. The casino operates 24 hours a day, seven days a week. The majority of table games dealers are employed on part-time contracts. Table games dealers also work on cruise ships. Christchurch Casino website, accessed October 2017, (www.christchurchcasino.nz). McNicol, H, 'Skycity Profit Drops as VIP Gambler Turnover Falls and Disruption Hinders Growth', 9 August 2017, (www.stuff.co.nz). Ministry of Business, Innovation and Employment, '2006-2014 Occupation Data' (prepared for Careers New Zealand), 2015, (www.mbie.govt.nz). Patel, K, recruitment advisor, Skycity Auckland, Careers Directorate – Tertiary Education Commission interview, October 2017. Table games dealers may progress into supervisory and management roles. Bank workers receive deposits and pay out money, keep records of transactions, issue receipts, and advise customers on banking services and products. Bartenders prepare and serve drinks in bars, restaurants and clubs.